A 26-year-old woman, gravida 1, parity 0 (G1P0﻿), presented to her doctor with vaginal bleeding and reports of irregular bleeding for 3 months before presentation. Her past medical history was significant for a history of polycystic ovarian syndrome. She did not have any previous surgeries. She reported no allergies and family history was only significant for a paternal aunt with colon cancer. On physical examination the patient was noted to have a cervical mass that was biopsied and showed evidence of poorly differentiated squamous cell carcinoma. The cervical biopsy (Figure 1A and B) was composed almost entirely of fragments of invasive carcinoma involving the full tissue thickness of the biopsy ( 8.0 mm ). Morphologically, the tumor was characterized by predominantly islands of monotonous, round cells with scant cytoplasm surrounded by a dense infiltrate of lymphocytes. Although there was only focal evidence of squamous differentiation within the invasive component, tissue fragments containing surface epithelium demonstrated the presence of high-grade squamous intra - epithelial lesion / cervical intra-epithelial neoplasia 3 (HSIL/CIN 3 ) . The differential diagnosis for carcinomas with this histologic pattern includes neuroendocrine carcinoma, which can also be observed in combination with other histotypes including squamous cell carcinoma. 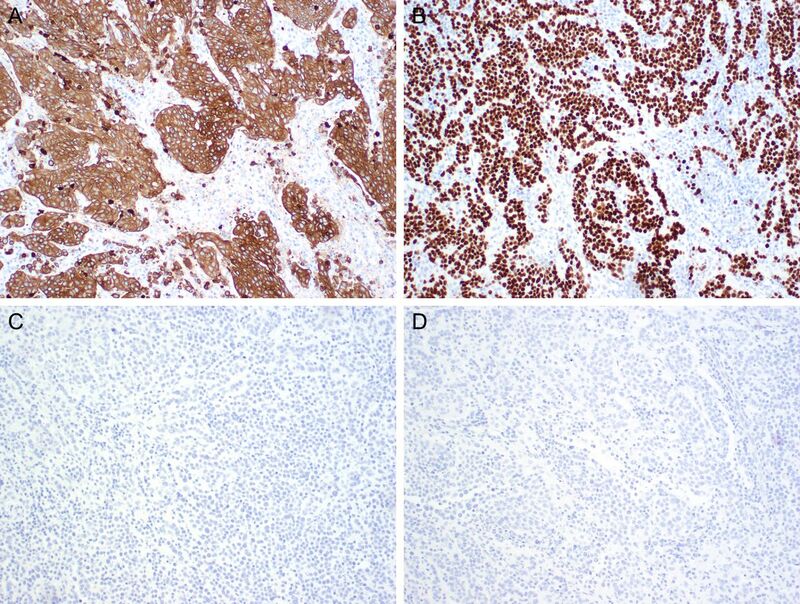 The presence of neuroendocrine carcinoma within the biopsy was excluded by performing immunohistochemical stains. Cervical biopsy at diagnosis (A) and (B). In addition, a urine pregnancy test was positive and an ultrasound confirmed a 6-week pregnancy. The patient was then referred to the MD Anderson Cancer Center for further management. At that time, the patient was evaluated and a repeat pelvic examination revealed an exophytic cervical tumor measuring 3 cm with no evidence of parametrial or vaginal involvement. No extension to the pelvic sidewall was noted. She was diagnosed with a 2009 International Federation of Gynecology and Obstetrics (FIGO) stage IB1 cervical carcinoma. The patient expressed an interest in maintaining her pregnancy. What would be your discussion with the patient at this time? This patient has a 2018 FIGO stage IB2 ( 3 cm ) poorly differentiated cervical squamous cancer diagnosed during her first trimester of pregnancy with a strong desire to preserve her pregnancy. A multidisciplinary approach involving the patient , her obstetrician, and the gynecologic oncologist is required to provide the patient with the most appropriate recommendations. She has an early pregnancy and a delay in treatment — although this has been previously performed and reported — always carries uncertainty, particularly with larger size tumors and high-grade histology. Options during first trimester include: ( 1) definitive treatment with termination of pregnancy — either surgery with abdominal radical hysterectomy and pelvic node dissection/mapping or definitive radiation with chemotherapy;( 2) observation — delay until fetal maturity — followed by delivery and immediate definitive therapy,surgical or chemoradiation;( 3) gravid trachelectomy during the early second trimester with pelvic lymphadenectomy;( 4) neoadjuvant systemic chemotherapy — delay in delivery until fetal maturity — followed by delivery and definitive treatment. According to t he International Gynecologic Cancer Society ( IGCS ) and the European Society of Gynecologic Oncology ( ESGO ) g uidelines, 1 treatment options for stage IA2 or IB1 tumors vary depending on whether the diagnosis is before or after 22 – 25 weeks of gestation. Generally, those diagnosed before 22 – 25 weeks should undergo pelvic lymphadenectomy and, if lymph nodes are found to be positive, definitive radiation and chemotherapy is recommended. For tumors < 2 cm with negative nodes, the guidelines recommend simple trachelectomy or conization. The guideline recommendation for patients with 2009 FIGO stage IB1 tumors ( > 2 cm ) and negative nodes is neoadjuvant chemotherapy until fetal maturity. Of note, radical trachelectomy in the setting of cervical cancer > 2 cm is not recommended by either of these guidelines. What would be the work-up for this patient as it pertains to imaging studies? In this setting, the most useful imaging modalities are pelvic magnetic resonance imaging ( MR I) without gadolinium in addition to a comprehensive obstetrical sonogram. 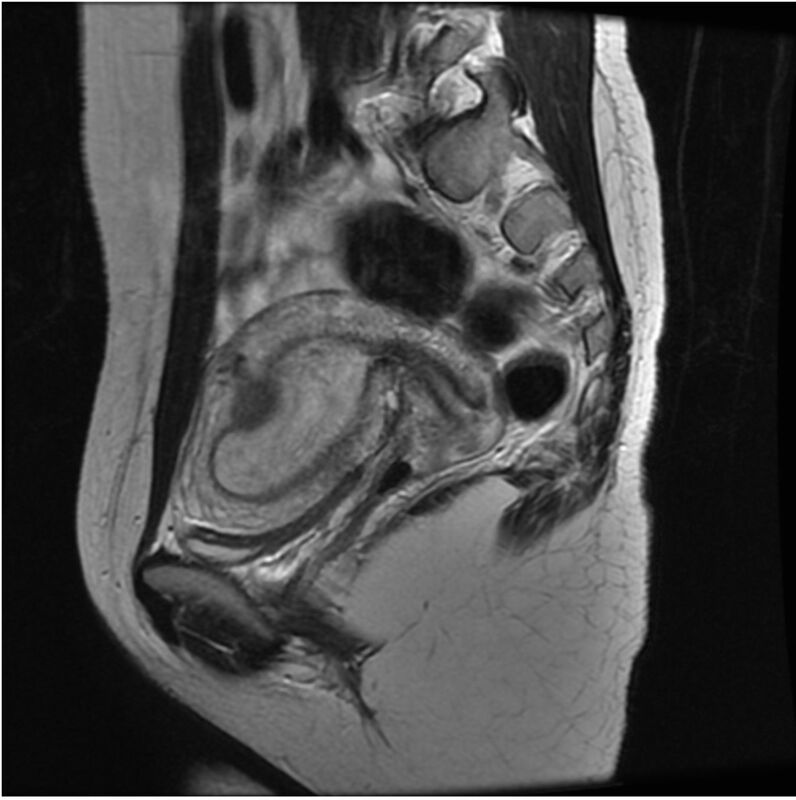 The MRI should report the dimensions of the cervical tumor, depth of cervical stromal invasion, proximity of the cranial aspect of the cervical tumor to the internal cervical os,and any evidence of suspicious pelvic nodes or obvious extra - uterine pelvic disease. Pelvic MRI showed a gravid 10 cm uterus and a 30×17 mm mass in the ectocervix involving the anterior and posterior cervical lips. There was no evidence of pelvic adenopathy (Figure 2). The patient was provided all potential options, as mentioned above; however, she strongly desired preservation of her pregnancy. At 12 weeks gestation, the patient underwent a bilateral robotic pelvic lymphadenectomy and a simple vaginal trachelectomy. Pelvic MRI at 10 weeks gestation. Can you discuss the safety and feasibility of sentinel lymph node mapping in pregnant patients? Sentinel lymph node mapping during pregnancy has been reported mostly in the breast cancer literature. In breast surgery, filtered Tc-99m sulfur colloid is usually injected in to the breast and initial reports of lymphoscintigraphy during pregnancy appear to show low risk to the fetus. 2 The first reported case of the feasibility of sentinel lymph node mapping with Tc-99m in a woman with cervical cancer was in 2006. ﻿3 Ten years later, Papadia et al reported the feasibility of indocyanine green mapping in two pregnant patients with cervical cancer. 4 No adverse events were reported. It should be noted that the commonly used dyes for cervical injection and sentinel lymph node mapping, isosulfan blue and indocyanine green , are assigned a pregnancy category C by the Food and Drug Administration . The majority of sentinel lymph node mapping reports during pregnancy are from the breast cancer and melanoma literature and patients should be informed about the limited information available in women with cervical cancer. Post-operative pathology revealed a 40×35×30 mm, grade 3, squamous cell carcinoma, with depth of invasion 12 to 16 mm. There was evidence of lymph-vascular invasion. Endocervical and ectocervical margins were not involved, but the tumor came to within 1.0 mm of the mucosal margin. A total of 15 nodes were removed. There were two lymph nodes with isolated tumor cells, one on the right (1/8) and one on the left pelvic node (1/7). The patient underwent ultra-staging because the initial hematoxylin and eosin (H&E) sections of the nodes had no definitive tumor; however, due to the presence of extensive lymph-vascular invasion and morphologic features of the carcinoma, a keratin stain with an ultra-staging protocol was performed on all blocks containing lymph node tissue (Figure 3A,B). H&E stains showing lymphvascular invasion (A) and (B). Cervical tissue was consistent with a 4.0 cm mass arising from the transformation zone. Histologically, a poorly differentiated carcinoma with features similar to those observed in the cervical biopsy infiltrated deep into the cervical stroma. Due to the overlapping histologic features between poorly differentiated squamous cell carcinoma and neuroendocrine carcinoma as well as the potential for the presence of more than one histotype in the resection, immunoperoxidase studies to exclude the presence of a neuroendocrine carcinoma in the resection specimen were repeated (Figure 4A-D). No evidence of neuroendocrine differentiation was detected by immunohistochemistry, as there was no expression of chromogranin, synaptophysin, or CD56, and the diagnosis of poorly differentiated squamous cell carcinoma was confirmed. Immunoperoxidase studies of cervical tumor (A–D). Initial review of the H & E sections of the bilateral pelvic lymph nodes (Figure 5A–C) had no definitive tumor. Although these lymph nodes were not designated as sentinel, the small round cell characteristics of the cervical tumor had the potential to mimic lymphoid cells making their detection by H & E examination challenging. Therefore, a keratin stain was performed on all blocks containing lymphoid tissue. The keratin stain highlighted cells within the subcapsular sinuses and the interfollicular cortices of the lymph nodes initially thought to be immunoblastic in nature. A p40 immunoperoxidase stain confirmed squamous differentiation. H&E stains and immunoperoxidase studies of pelvic nodes (A–C). Based on the post-operative pathology, what would be your recommendations to the patient if she still wished to maintain her pregnancy? Given the evidence of bilateral pelvic lymph node involvement, even in the setting of isolated tumor cells, one would be inclined to offer immediate adjuvant therapy in the form of radiation and chemotherapy after termination of pregnancy — h ighlighting the fact that,at this time, there is no standard recommendation as to the conduct to be followed when finding isolated tumor cells in the setting of early cervical cancer. However, since the patient wished to maintain her pregnancy, one potential option is the consideration of chemotherapy alone until fetal maturity is reached,and then offering definitive treatment. If considering such an approach, a cisplatin-containing regimen such as cisplatin ( 50 mg/m 2 ) and paclitaxel ( 175 mg/m 2 ),with a plan for treatment until fetal viability is reached, is a reasonable strategy. Most reports describe a 21 - day cycle regimen. The patient was extensively counseled to undergo chemotherapy and radiation; however, she declined and decided to continue her pregnancy. At that point, the patient was counseled to undergo treatment in the form of cisplatin (50 mg/m2) and paclitaxel (175 mg/m2) with a plan for treatment until fetal viability. She began her treatment at 20 weeks gestation. She completed a total of two cycles of chemotherapy but at 28 weeks (29 days after her second cycle of chemotherapy) she had pre-term premature rupture of membranes. She delivered a 1020 g newborn by Caesarean section. The patient was offered an ovarian transposition in anticipation of the projected radiation therapy and opted against it after a discussion regarding potential risks. What recommendations would you have for the patient at this point after her delivery? Based on her risk factors, definitive chemoradiation is a very reasonable strategy post - partum. Ideally, treatment should be started within 6 weeks of delivery to allow the uterus to return to its normal size. One point that should be discussed with all young patients who are recommended pelvic radiotherapy is ovarian transposition. The rate of ovarian preservation after ovarian transposition and external beam pelvic radiation and/or brachytherapy is 65 %.5 However, it is important to discuss the potential risks associated with this procedure such as torsion, ovarian cysts, bleeding, pain, and endometriosis. One should note that in the large meta-analysis by Gubbala et al,5 the authors reported no cases of metastasis to the ovaries after transposition in 892 cases. After her delivery, the patient underwent treatment with chemotherapy (weekly cisplatin) and completed 23 fractions of external beam radiation followed by brachytherapy. After 27 months of follow-up she has no evidence of disease and the baby is alive and healthy. What would be your discussion with the patient regarding routine surveillance? After definitive treatment for stage I cervical cancer, one usually recommends following patients clinically with a physical exam ination every 3 – 4 months for the first 2 years , and then every 6 months for 3 more years. There is no definitive proven added value to routine imaging and, in general, imaging is requested based on patient symptoms or concerns during routine physical evaluation. A Pap smear once a year is also recommended. Hormone replacement therapy is an acceptable option given the patient ’s age. Cervical cancer during pregnancy may be managed successfully; however, this requires a comprehensive multidisciplinary team. In patients with early disease, one must always have an extensive discussion with the patient regarding the available options and the risks associated with each of those options, focusing the discussion on the risks to the fetus and the risks to the mother. Recently, Salvo et al 6 evaluated the role of simple trachelectomy and pelvic lymphadenectomy in patients with FIGO (2008) stage IB1 ( ≥ 2 cm ) cervical tumors wishing to maintain their pregnancy. This was a small series of five patients with a median gestational age of 12 weeks (range 7 – 18) and median gestational age at treatment intervention of 16.5 weeks (range 12 – 19) . All patients underwent laparoscopic ( o ne ) or robotic ( four ) pelvic lymphadenectomy followed by vaginal simple trachelectomy. After a median follow-up of 75 months (range 18 – 168 ), all patients were alive without disease. In their work, the authors concluded that simple trachelectomy with pelvic lymphadenectomy with lymph node dissection may be a safe option in pregnant patients wishing to maintain their pregnancy. Often, as in this case, the path to a treatment recommendation may not be straight forward, and the recommendations may be based on retrospective case series. Here, we demonstrate a case where some might argue there were deviations from standard practice; however, this highlights the importance of discussion and careful consent process when moving forward with such recommendations. Fortunately, both mother and child are well, thus highlighting the importance of taking careful steps in the management and surveillance of such patients . Contributors PTR is the presenter, EE is the pathologist, and NA-R is the discussant.